This fall, the Lazaridis School of Business & Economics accepted its newest cohort of outstanding leaders to the Executive Master’s in Technology Management (Lazaridis EMTM). 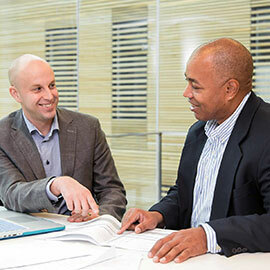 The Lazaridis EMTM is an 11-month Master of Science (MSc) in Management that delivers unique executive-style education—the only MSc of its kind in Canada. The learners are from a diverse range of technology companies and technology-adept organizations, including Xerox Research Centre of Canada, BMO Financial Group and Compass Group Canada. Classes are held in the newly opened $103-million, state-of-the-art, Lazaridis Hall in Waterloo, Ontario. In the Lazaridis EMTM, learners complete 10 integrated courses which are directly applicable to their real work environments. Classes are focused on highly relevant topics, including design thinking, strategic planning, technology road mapping and team building. The Lazaridis EMTM brings together a small cohort of candidates to work closely and collaborate. Learners work together in the same group for the 11-month program, facilitating a strong network of peers who bring their knowledge and skills to advance Canada’s innovation economy. Applications are currently being accepted for Sept. 2017. Class size is limited to ensure candidates fully benefit from the expertise of faculty members, guest lecturers and industry speakers.